The CS-R3 is incredibly lightweight and well ventilated thanks to the advanced polycarbonate composite shell and ACS (Advanced Channeling ventilation System) which pulls air through the helmet. Additionally, the RapidFire Shield Replacement System removes frustration from the equation by simplifying the process of swapping shields on the go. 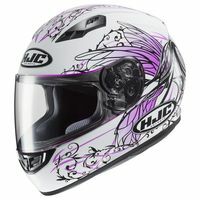 The CS-R3 Helmet from HJC offers premium features without the premium price tag.